This mod includes changes i've played with, most of my time playing Tiberian Sun. 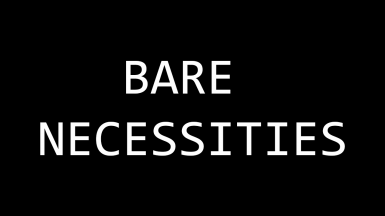 Bare Necessities is licensed under a Creative Commons Attribution-NonCommercial-ShareAlike 4.0 International License. Rights for the SoundUP tool is reserved for the author. - Nolonger will the terrain make craters when it receivers large portions of damage. Removed the hunter seeker drone. Removed building damage when no power. - Check out my "SHIFT+" mod for an easy way to handle larger than 5 order queue. Orca, Orcabomber, Harpy, Banshee, Carryall, Subterranean APC, Subterranean Flame Tank, can now all move into fog. Backup "rules.ini" and "sun.ini" somewhere safe. directory then click "start" and that's it!